Robbery – On July 30, 2016 at 10:21pm, officers were dispatched to the Quick Check at 533 Atlantic City Blvd. for a reported robbery. Upon arrival officers were advised that a 19 year old gas attendant told store personnel that he was robbed and cash was stolen. Patrol officers secured the scene and worked to secure video footage from the store. Detective Sergeant Altman and Detective Magory responded to the scene and continued the investigation. The gas attendant advised detectives that he was approached while in the rear of the building near a tree line and that two males took the cash he had on him from pumping gas. The gas attendant had a very limited description of the actors and was only able to offer a clothing description. The amount of cash stolen was in excess of $500.00. The investigation is ongoing. Theft – On July 31, 2016 at 4:36pm, Patrolman Dennis Allen responded to a residence on the 900 block of Ocean Avenue for a theft report. Upon his arrival, the victim advised that a blue Mongoose bicycle was taken from the back yard sometime between July 28 and July 31. On August 02, 2016 while on patrol, Patrolman Allen observed a juvenile riding a bicycle which match the description of the one he had previously taken a report for a few days prior. Upon confirming the bicycle to be stolen, the juvenile was transported home to his parents and a juvenile contact form completed. The bicycle was returned to the owner. Theft – On August 02, 2016 at 8:52am, Patrolman Sean Langan was dispatched to a residence on the 500 block of Barnegat Blvd., for a theft report. The resident reported that sometime during the overnight hours someone entered his unlocked vehicle and removed change from the vehicle. DWI – On August 02, 2016 at 6:22pm, Patrolman Keith Meissner was dispatched to the area of Berkeley Ave and Pine Street for a possible disabled vehicle. Upon the officers arrival, he located the vehicle and began speaking with the driver. As a result of the officers investigation it was determined that the driver was under the influence of alcohol. The driver, Laurie Sullivan, 55 years of age from Beachwood, was arrested and charged with driving while intoxicated. She was transported to Beachwood Police Headquarters for processing and then released on summonses. Property Damage – On August 03, 2016 at 9:20am, Patrolman Adam O’Connor responded to a residence on the 100 block of Ship Ave for damage to a mailbox. The tenant stated that sometime during the overnight hours their mailbox was broken. Theft – Patrolman Sean Langan responded on August 03, 2016 at 2:15pm, to a residence on the 300 block of Ship Ave. for a theft report. The resident advised that a 9 inch Samsung tablet was stolen from their vehicle which was parked unlocked in the driveway. Narcotic arrest – On August 04, 2016 at 10:04am, Patrolman Justin Apel was dispatched the area of Route 9 and Beachwood Blvd. for a male subject acting suspicious. The officer located the subject who advised he had used drugs earlier and was not feeling well. During the officers investigation it was discovered that the male subject had heroin in a cigarette pack. The subject was charged on a summons complaint and transported to the hospital for further evaluation. The same subject, a 25 year old male from South Toms River was arrest again on August 08, 2016 for the same violation. Credit Card Fraud – On August 05, 2016 at 6:00pm, Officer Gina Bruno responded to an address on the 600 block of Seaman Ave. for a report of credit fraud. The victim stated that they observed charges on their credit card which they did not make. Theft – On August 06, 2106 at 2:34pm, Officer Manganiello responded to the CVS on Atlantic City Blvd. for a theft report. Store personnel reported that sometime between July 16 and August 02 several boxes of over the counter medication were discovered to be missing. There was no information about a possible suspect at the time of the report. DWI – On August 06, 2016 at 6:12pm, Patrolman David Bowden conducted a motor vehicle stop in the area of Atlantic City Blvd and Admiral Ave. As a result of the officers stop and investigation it was determined that the female driver was operating the vehicle under the influence of drugs and/or alcohol. The driver, Cassie Hansen, 27 of Waretown, was arrested and charged with Driving while Intoxicated. The female was transported to police headquarters where she was processed and issued several other motor vehicle violations as well. The case is pending a court date. Shoplifting – On August 08, 2016, Patrolman Justin Apel was dispatched to the Quick Chek on Atlantic City Blvd. for a shoplifting complaint. A report was lodged but the suspected actor had left the store prior to police arrival. 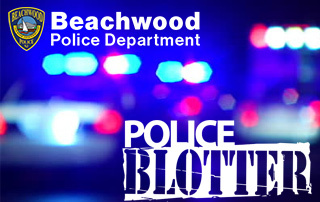 Theft – On August 09, 2016 Officer Gina Bruno responded to a residence on the 1400 block of Pacific Ave where the resident reported that a handicap placard was taken from their vehicle. Burglary – On August 11, 2016 at 4:47pm, officers responded to a residence on the 100 block of Admiral Avenue for burglary report. Upon the officers arrival, the resident advised that several credit cards and a watch were taken from the residence sometime prior to the report. While Sgt. Mussari was on scene along with Patrolman Meissner information was developed about a possible suspect who was believed to be at the 7-11 store in Toms River. Patrolman Meissner responded to that location and located the suspect, who was in possession of several of the stolen items. As a result, Charles Carroll, a 48 year old male, was arrested and charged with burglary, theft and receiving stolen property. Carroll was lodged in the Ocean County Jail on $15,000.00 bail.